As a division of Stokes Inc., the ThinkKitchen mission is to provide a unique shopping experience in a world-class environment. ThinkKitchen provides customers with outstanding personal service, while combining quality, design and value. Visit stokesstores.com, and see how we strive to become the destination for specialty kitchenware and housewares. Order bulk Thinkkitchen gift cards from National Gift Card Canada today! 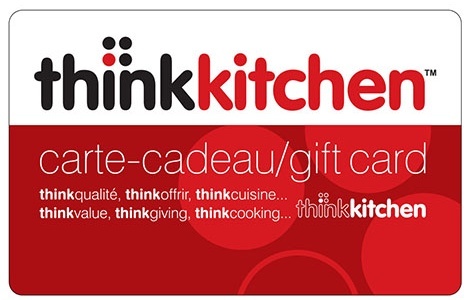 This gift card is redeemable for merchandise only, at any ThinkKitchen location in Canada. It is not redeemable for cash, except where prohibited by law. Purchases will be deducted from the gift card amount until the value reaches zero. Please safeguard your card. ThinkKitchen is not responsible for lost, stolen or unauthorized use of this card. To check your balance, visit any ThinkKitchen location or www.thinkkitchen.ca. Treat this cards like cash. Also valid in all Stokes stores.